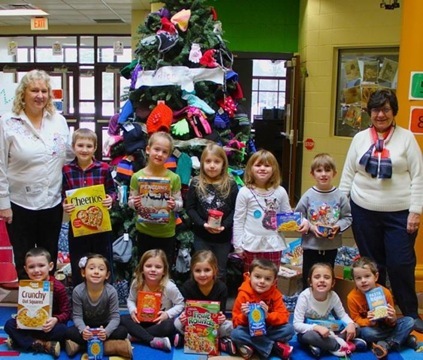 The Pre-K and Kindergarten teachers of Perkins School, in collaboration with the faculty, staff, parents, and students, spent the month of December 2016 collecting for the Newark Food Closet. Front row from left: Matthew Meyers, Adeline Reynolds, Eliza Wells, Elynn Poole, Anderson Burgess, Sloane Colling, and Riley Mayo. Back row from left: Mickey Sargent from the Newark Food Closet, her grandson, Hayden Bridger, Emma Haynes, Myla Kidder, Arrissa Pallister-Eller, Mason Wetmore and Dolly Velte from the Newark Food Closet. Aranzullo said she and Cory Robinson, the other UPK teacher at Perkins, along with Kindergarten teachers Kathleen Stanely, Elizabeth James, Tiffany Cohrs, Caitlin Arbogast and Stephanie Potter are responsible for the drive. 0 Comments to "Perkins School Collects for Newark Food Closet"